You work hard as a freelance writer or editor to market yourself in a globally competitive workplace. You buy ads, craft pitches, place bids. And then, just when you’ve got a live, interested client on the line, he slips out of your grasp like a wet, wiggling trout. How can you close a deal successfully every time? The following 20 tips will help keep you focused and get you prepared for that all-important moment when it’s time to seal the deal with a new client. Are you looking to break away from your 9-5 job and start down the path to full time freelance writing? 1. Be clear about the client’s goals. Of all the tips to land new freelance clients, this may very well be the most important one. Clients are often fuzzy when describing what they want or expect. First-time clients in particular probably don’t know what information you need from them. 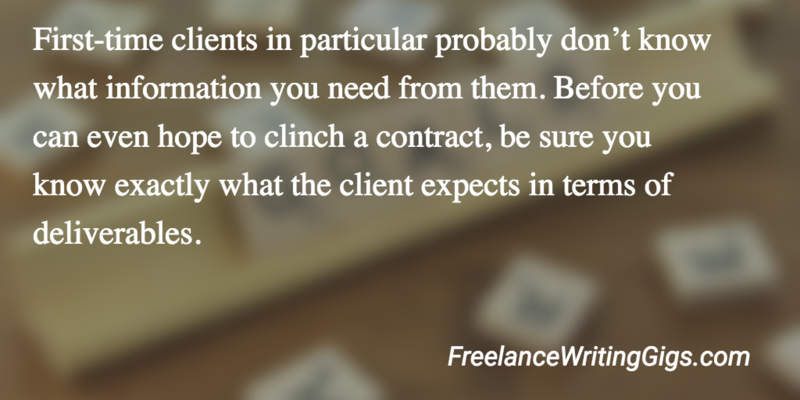 Before you can even hope to clinch a contract, be sure you know exactly what the client expects in terms of deliverables. Even if a client has expressed interest in your bid or pitch, take the time to get complete clarity about their goals. 2. Anticipate the client’s questions. Typical client concerns involve time, accuracy, experience, cost, needs, and milestones. Be as specific about details as you can in your bid or pitch, but also be prepared to explain and defend these items to the client in person. 3. Be prepared to give new clients a walk-through. Many first time clients do not understand what’s involved in the process of hiring a writer, ghost-writer or editor. Be patient, and be ready to explain all the steps involved. What may seem like second nature to you could be a whole new planet for someone else. You may need to explain the necessity of conducting interviews, preparing transcripts, creating outlines, getting approval, and so on. 4. Be careful with promises. Clients sometimes have unrealistic expectations. If they have an idea for a book, they want you to provide them with a best seller. If they want you to create social media content, they might expect you to guarantee them 100,000 followers. Be transparent and very, very clear about the difference between their goals and your process. While emphasizing your experience and past successes, make sure they understand that they are paying you for actual work—not their ultimate failure or success as an author or business. 5. Make sure your written proposal is clear and precise. If you have the opportunity to provide a written proposal first, make sure it describes your process in layman’s terms. Also, be very clear about the number of hours you will spend on this project. Since most new clients have no idea how many hours it takes to complete a project, rely on a word count whenever you can. But also anticipate time-consuming tasks like rewrites, more editing passes, and phone calls. 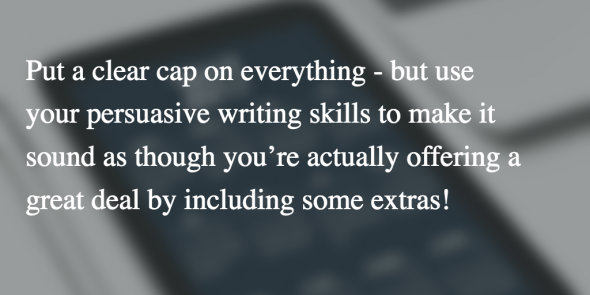 Put a clear cap on everything – but use your persuasive writing skills to make it sound as though you’re actually offering a great deal by including some extras! 6. Keep the focus on the project. When you’re trying to close a deal with a client, don’t let the conversation veer for long into the depths of the client’s dreams or their personal life story. Of course, you want to know a little more about your client, and it’s perfectly okay to chat for a little while as a conversation starter but keep the initial phone call or face-to-face meeting focused on the project and the contract. 7. Be engaged and enthusiastic. Use this opportunity to learn more about your clients and their dreams. Get freelance clients interestested by letting them know that this is more than just a job for you. They love to hear freelancers say things like, this is exactly the kind of work I like to do! Or, I am so excited to work on your project, it’s right in my wheelhouse. Make your client feel special and original. Periodically check your progress with the client during any conversation. Ask them if they have any questions so far and make sure they understand what you’ve explained up to that point. Even if they seem to be following you, pausing to check in with them is good etiquette, and it gives you both a chance to catch your breath. 9. Get the client to say ‘yes’ several times. This is a tried-and-true sales technique. When you pause to check in with the client, you want them to say, yes, I understand, but you also want them to accept your proposal. If you can get them to say yes several times, they will be more likely to say yes to the whole deal. If the client has questions or objections, respond with affirmatives like exactly, precisely and absolutely. Let the client know that you absolutely understand their objections and that you have precisely the solution they need. Put your creative talents to good use when speaking with clients. Often they’re not thinking about the actual process but rather the end result. They visualize themselves as a published author, successful blogger, or a successful entrepreneur thanks to excellent sales copy. Help them visualize the end result by describing how your services will get them to their end goal. Describe the smooth flow of the writing, the well-organized chapters, the tight fact-checking, the alluring jacket blurbs. Talk about the word count and how that translates into the weight and heft of a print book. Get them thinking about their cover design. If you can help them believe in their success, they’ll believe that you are the person to get them there. 12. Turn price into value. If your client is waffling on the cost, remind them how much it would cost to achieve their goals if they looked elsewhere. Many clients who go for cheaper options end up having to get the work redone by a professional. 13. Be willing to offer this-or-that choices. If your client isn’t sure they want the entire package you’re offering, have some alternate solutions, complete with pricing, ready to offer. Having alternative choices prepared ahead of time will save you from waffling on price if your client tries to shave off pennies during a discussion. Don’t offer too many choices—after a strong presentation, you don’t want to lose your positive energy by creating confusion in the buyer’s mind. Keep the choices to two, three at most, and you’ll be more likely to close a deal. 14. Know where you can be flexible. Decide ahead of time what you absolutely must have if you’re going to do business with this client. If there’s a service fee through a third-party site or other costs, keep that in mind and decide what your minimum charge must be in order for an assignment to pencil out. Decide which options or services you might be able to carve away if the client requests a smaller fee. 15. Break it down into milestones. Whether you’re discussing options or moving toward an actual plan, clients always appreciate it if you offer to set up milestones. You can offer performance milestones (agreed upon deadlines for various steps in the project) or you can break your fee up into separate invoices tied to each milestone. Milestones let the client know that they’ll be able to see some work soon. 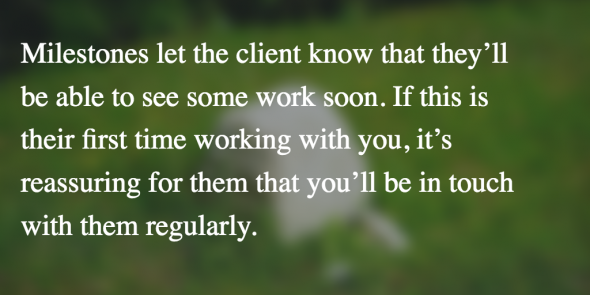 If this is their first time working with you, it’s reassuring for them that you’ll be in touch with them regularly and showing them your work throughout the project. Also, breaking down the billing into increments makes a large fee more palatable. 16. Sweeten the deal, but only if you have to. Nothing says kiss of death to a deal more than having the client say, I’ll think about it. If you really want to close a deal and you’re not sure the client is completely sold, offer an extra service that you can easily afford, but that spells added value to the client. You could add some free follow-up time for mentoring, extra editing passes, social media content creation, or some sales copy. Don’t leave these offers open-ended, however. Put a cap on time or word count, and also make it clear that the offer of extras is time-limited. Tell the client that you can add this right now because you have some openings in your schedule through [select a date]. Don’t say, I won’t be able to do it after that date—remember tip #6: only use positive language! 17. Make them work for it. If you have to negotiate, don’t be too eager to give more of yourself away. Save any offers of discounts, bonuses, concessions and value-adds for the very end. If your prospect is still wavering, offer them ways to “earn” a better price or discount. For instance, if the client wants to shave off $200 you could say, well I’ll have to take off the second proofreading pass, but I could add in some social media content and still come in under your budget. I know it’s counter-intuitive, but when people have to give up one thing and then apparently get two things in return (a big discount and another service), they’ll come away feeling as though they’ve gotten the upper hand and a great deal. 18. Talk past the close. This sales technique helps the customer jump over the speed bump of actually having to make a decision. Ask things like, how many of these milestones would you like me to set up? How would you like me to send documents and what format do you prefer? Would you like a weekly check in call? By phone or Skype? Partly, this reassures the client that you will be available and attentive to their needs. It also helps them visualize their relationship with you—and once they start visualizing this, they’re more likely to be comfortable with the idea. Warning: Don’t let the client just hang up or leave in a pink cloud of happiness, thinking wow, I have an editor, that was so easy! Of course, you want them to think that, but don’t let them go without getting an actual signature on a contract and a down payment! 19. Close with a relevant story. If you’re a writer, you’re a storyteller—so you understand the power of a good story. We make decisions with the right side of our brain, which is stimulated by stories, pictures and music. Give an example, tell a story about a happy customer. At the end of your meeting, summarize all the key points and benefits. You want to hit all the top bullet points and leave them fresh in your client’s mind so that when they sign off, they feel enriched, empowered and excited. Remember, when it comes to closing, it’s all about helping the client feel comfortable with their decision. You want to validate your customer’s decision to work with you and leave them feeling confident and comfortable in your hands. Excellent tips! 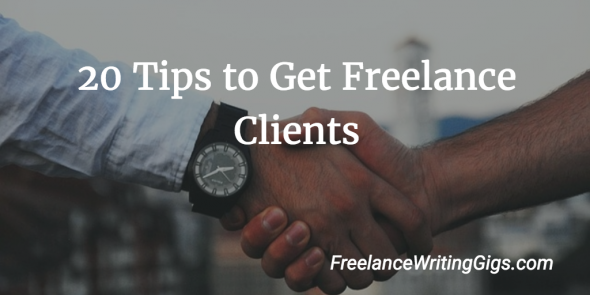 I think you positioned the most important at the top of the list…”Be clear about the client’s goals.” To me this makes or breaks the success of the freelance gig. When you and the client are disconnected about goals, you cannot deliver to the client’s expectations. This means rewrites, revisions, and a less than stellar review from the client. You want to nail the assignment as close to the client’s goal as possible. Doing so means repeat business. Of course, sometimes the client doesn’t really know their goals. In that case you have to question the client in detail about what they want to accomplish with the piece. I usually take it a step further and send them a confirmation email about the goal and ask them to acknowledge it.